This review reflects Greenwood CA North of Concession #5. The review of this CA South of Concession #5, can be found here Greenwood South of Conc #5 Review. There are two access points to this section of Greenwood CA. One is on the North side of Concession # 5 between Greenwood Rd. and Church St. N. where there’s a very large parking lot. The second access is from the Trans Canada trail on Hwy # 7 (Eastbound) approx. 2.1 kms from Brock Rd. Probably not your best access site, but I mention it just to be thorough. This review will begin from the parking lot on Concession # 5. Since there are no markings to differentiate the trails, I would suggest you print out the trail map and take it with you. Basically, there are two main trails in this tract. The Trans Canada Trail mostly hugs the banks of Duffin’s Creek and has three well built bridges to cross. The creek is very picturesque and clearly visible and audible from the trail. At about ¾ it’s length, it takes a sharp turn to the West where it climbs a very steep incline up to the height of land the Greenwood loop trails are on. The very Northernmost stretch traverses a bit of forest before crossing an open meadow to Hwy # 7. The Trans Canada Trail is linear, but as it passes through Greenwood, it can be used as a riverbank loop with the Greenwood loop trails. The Greenwood Trail is an ovoid loop with a lot of interconnecting trails between. This is nice because it offers you about seven loop trails increasing in length from about one km to four. You could even take a zig-zag approach and cover more ground. I’m rarely grateful for fake forest (man planted rows of pines meant to control erosion back in the 1940’s), but the one patch of it (right smack – dab in the middle of the loop) makes it easy to determine your position on the trails. Another plot of fake forest consisting of rarely seen bottlebrush pines (they have extremely long needles and are impossible to miss) in the lower ¼ of the loop will indicate you’re nearing the end of the trail at the parking lot. Combine those with a huge meadow at the North end (with Hwy #7 and the newly constructed 407 less that half a km distant), and it’s rather easy to navigate your way around here. So, you have your choices. You could take the Greenwood Loop Trail and walk through wooded areas and open meadows with views of ravines and rolling hills (that’s views of hills, not hills you have to walk). 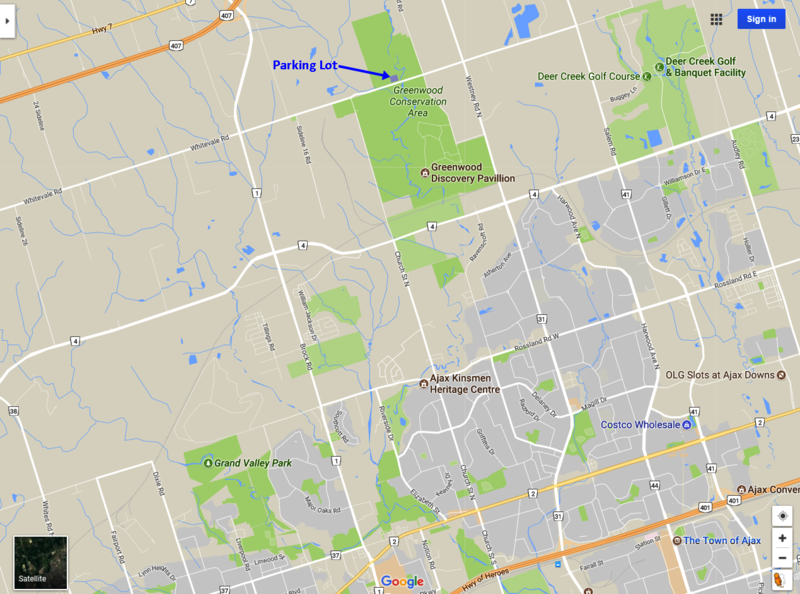 Or, you could walk half the Greenwood Loop , then cross over to the Trans Canada Trail and walk the banks of Duffin’s Creek back to the parking lot. 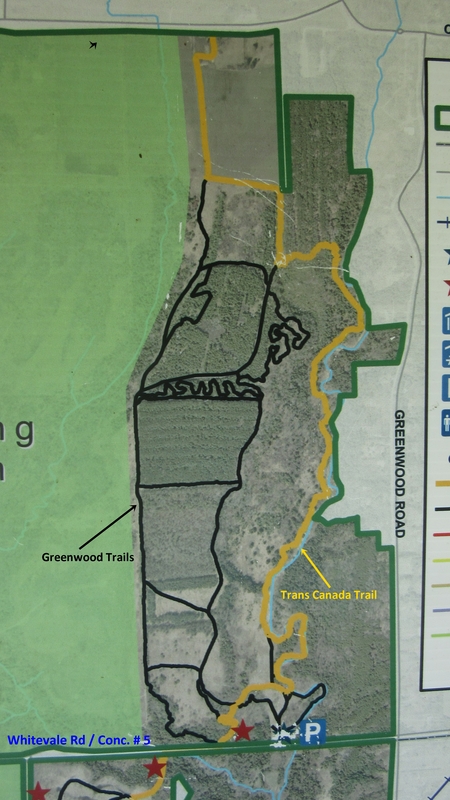 Then again, you could start off on the Trans Canada Trail, and cross over to the Greenwood Loop. Admittedly, the trail map can be a bit confusing. So, let me explain it as you’ll see it. From the trail head (with the covered kiosk and map etc) you’ll see a trail heading North. That trail will split. If you take it to the right, you’ll cross a meadow and link into the Trans Canada Trail along the creek bank. You’ll walk 1.5 km and climb a steep hill before hitting the Greenwood Trail to continue walking or loop back. If you go left, you’ll climb a moderate hill to a level plateau that will take you through forested stretches, meadows, a sharply falling ravine, and rolling hill views. At the North end you could return on the Trans Canada Trail along the creek bank, or complete the loop on the Greenwood Trail. The Outback – You might notice a sign just West of the parking lot on the South side of Concession 5. The sign simply says “The Outback”. It has vehicular barriers and a coupla large boulders as well. We walked in and wandered about, searching for an explanation as to what this Outback was supposed to be. We never did make any sense of it, though it had a pleasant view of two streams converging into one as it flowed South. Accessible from the North side of Concession # 5 where there’s a large parking lot, this set of trails are not marked (save the Trans Canada). However, they’re very heavily trodden, so, easy to follow. Some sections are obviously old farm roads. Just before you enter the meadow at the far North end, there’s an old wall-less barn (I assume abandoned, but the rest of it was in good shape). The trails are a blend of single file, and wide enough for two to walk at the shoulder. There’s a nice blend of ecosystems here too. We walked through canopies forests, open meadows, the crests of ridges, and alongside the creek. You might notice a few trails heading further West from the Western part of the Greenwood loop. These trails are unsanctioned as they’re on land described as “Coming Soon” on the trailhead map. Admittedly, we walked a bit of one, and though it was quite nice, the trail markers were unreliable. When it stared to meander off in the opposite direction from our trailhead, we turned back. When these “Coming Soon” trails arrive, they’ll be very nice. There are no facilities of any kind, nor any charge for parking or use. Just in case you checked, there’s no campground here as indicated on Google maps. between you and I these trails are actually quite good. Access from #7 is nice as the ESSO gas station has facilities AND after 5pm has the least expensive gas in the GTA..owners are super nice. Price ALWAYS drops later in the day. This TCT is now (humph..) renamed The Great Trail. dumb..everyone who hikes or wants to hike understands TRANS CANADA ! in several areas the last 2 years,usually starting in Springtime, there have been vehicle break ins. (specifically the south access). This has also occurred in North Tract, Whitchurch-Stouffville Parking Lot and one other i can’t recall. I am very very careful to keep nothing on my car seats or the floors. My wallet always comes in my pack and of course my cell phone. Even extra boots or shoes are tucked away. For sure 100% the last two years when warmer weather arrived the break ins started. up to you to post.. just thought the info would be helpful. Thanks muchly for the tips Martha.